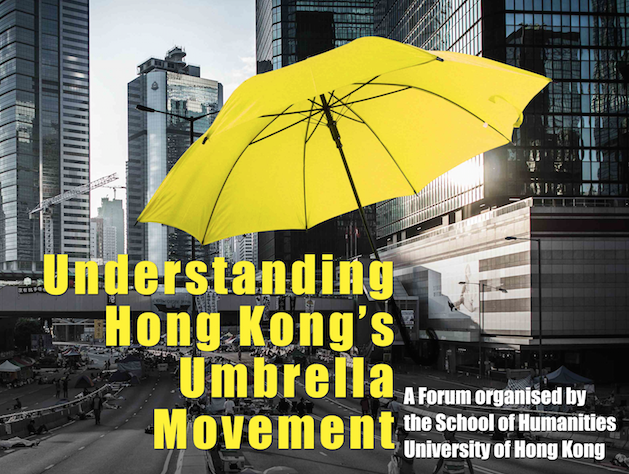 This Forum brings together a group of teachers and researchers from HKU to discuss Hong Kong's Umbrella Movement. Is this a new form of politics? What inter-generational dynamics are at work in this largely student-led movement? How has the experience of cultural identity shaped the demands of the students? Can Hong Kong politics ever return to 'business as usual'? What role should academics and universities play in the unfolding events? Where: Large Moot Court, 2/F, Cheng Yu Tung Tower, Centennial Campus, HKU. No Registration Required. Seating capacity: 300. Chair: Timothy O'Leary (Head of School of Humanities), Speakers: Joe Lau (Philosophy), Mirana Szeto (Comparative Literature), Stephen Chu (Hong Kong Studies), Joseph Chan (Politics), Marco Wan (Law).